I can’t believe it’s that time again! This year has gone by so quickly that I feel like I haven’t been able to catch my breath. It’s been an interesting year, I suppose – lots of good things happened, like graduating from university, my garden adventures, my first vacation in years, a great Rhinebeck with rachel and jaya. Of course, where there’s good, there’s always something to balance. The last couple months have been very difficult for me personally, and the going is still tough. Things take time, you know? Sometimes too much time to bear. But! New year’s is always a time of reflection, and rebirth, time to move forward and leave the past where it is. Tonight, my family is all out doing their partying things, and I’m at home with a bottle of Trocken in the fridge and just loads of Indian takeaway (tomorrow, I’m going off wheat, dairy and soy for a few weeks to clean my system up – tonight, I’m eating!). And knitting. I’ve got the possibility of one more FO of 2007 tonight. Pattern: based on a concept by the Purl Bee – I looked at the colours and the yarns, and did my own numbers, shaping, and details. Yarn: 3 skeins of Shelridge Farm W4 in Chocolate, 2 skeins in Misty Blue, 3 skeins of Rowan Kidsilk Haze in Villain. Okay, so it doesn’t have buttons yet. But I’ve worn it a few times, and I just love it! 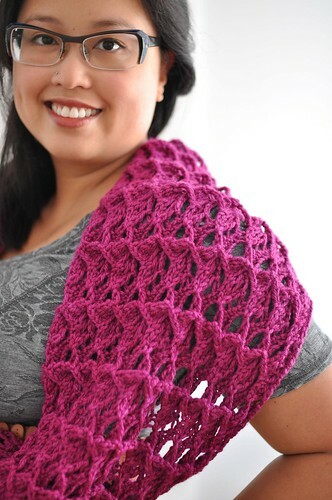 Next up, a surprise FO that jumped from the needles this week. Pattern: my own. Top-down raglan with crochet edgings. Yarn: 5 skeins of thick and thin merino from Americo Original, some random handspun merino from my stash. I started this on Christmas Day (Tuesday), I think, and wore it to work on Saturday. It’s pretty uncharacteristic of me, all that bulky wool and wacky edging, but it’s fun and very cozy. I even had the big buttons in my stash. To me it looks like a big version of a little girl’s sweater. 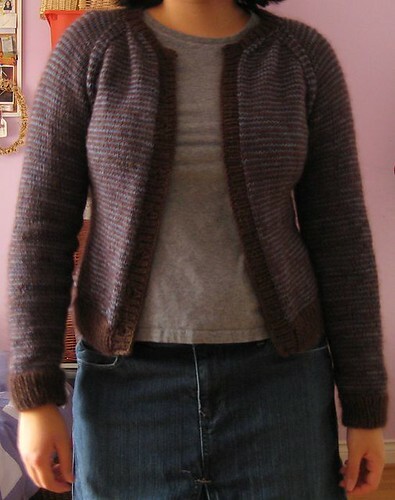 In 2007, I finished at least 18 tops or sweaters (there might’ve been an extra one or two in there undocumented), and a couple projects each of socks, shawls, skirts, and other assorted things. Here’s to even more in 2008. Bye, 2007, and well, good riddance. love the cardigans – especially the bulky one with the edging. The brown makes it grown up and cool – but it could still make a cute kid version as well… happy 2008! I love that brown top! It’s super cute! The brown cardi is so cute Laura! Nice job. I especially love the edging and button holes. Any chance you’ll make the pattern available? I’ll buy it! Both sweaters are really cute! And you’re right, the chunky one is like a kids sweater embiggened. It’s not my normal style either, but I do like it a lot! the bulky cardi is great. i particularly like the wacky edging and chunky buttons. very impressed with all of your work. happy new year! So pretty. Love the colors! I hope you have a happy, healthy 2008. Both are successful. I like the little gather at the shoulders in the striped cardi–it is flattering in a way I wouldn’t expect. I like the chunky one because it says “have fun and enjoy life!” in a warm, cozy way. I always enjoy seeing what you’ve been up to. Happy new year! Love your work! Is there any chance that we will be given a pattern for the brown cardigan with the big buttons? I love it! I’m especially loving your Treeline Cardi, with or without buttons. I really like the brown cardi it looks fun! The Treeline cardi is cute also but on a dreary day wear the brown cardi. I’ve enjoyed reading about all your knitting adventures this past year and I’m looking forward to 2008. Thanks for sharing. happy new year! that sweater is so cute! Happy New Year! Love both cardigans. 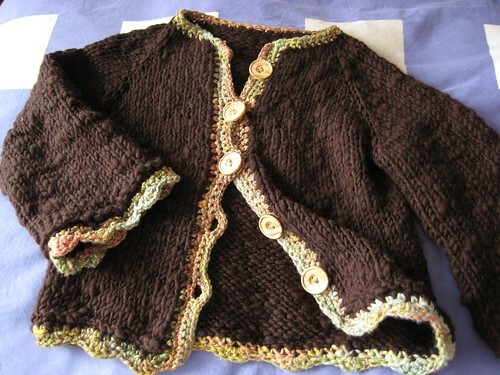 I would also love to be able to get the pattern for the brown cardigan with the crochet trim and large buttons. that brown cardi rocks! and so does your new do! lovin it! happy new year! I like little girl sweaters. They are more interesting and look more fun to make than adult ones. I am often disappointed when the pattern does not come in an adult size. You made 17 more sweaters than I did in 2007 but the one I did make was your Lucy in the Sky and I love it. I have enjoyed seeing your FO’s in 2007 and look forward to more. You are an amazing knitter. I envy your speed! Happy New Year. Your treeline cardigan is so cute! You have inspired me to try one of my own :) I’m thinking a green and brown one. Thanks for the inspirations. You are such an artist!